AvPlan EFB now depicts Low Jet Route (LJR) NOTAMs as regions on all charts. When such a NOTAM is issued, it will be depicted as a yellow region on your charts when ‘Active Airspace’ is displayed. Tap Map Settings, View Items, Active Airspace to enable the depiction of active restricted, temporary restricted and LJR NOTAMs. When the NOTAM is active, these regions will turn red (as per the image above). Double tap on the region and the NOTAM will be displayed. The depiction of LJR NOTAMs takes the guesswork on where the ADF are operating at low level. At a glance pilots can check to see if their route intersects with any current operations and alter their plans accordingly. 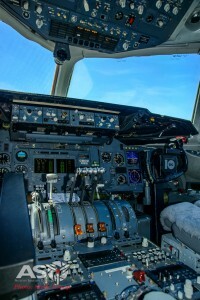 In addition while in flight you will receive notifications when such an area is ahead; as a notification on your device, on your Apple Watch or in your bluetooth connected headset. This unique capability is available to all Australian subscribers to AvPlan EFB. As another Australian summer winds down, Kevin Hopf, Chief Pilot for 10 Tanker Air Carrier, is preparing for his return to Alberquerque, New Mexico at the end of the fire season. 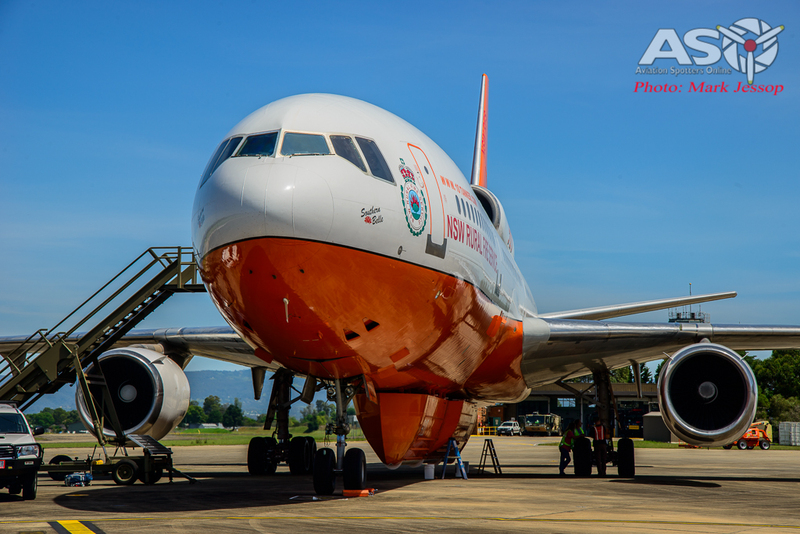 “We have three DC-10s converted into fire-fighting air tankers. The first was converted in 2006,” says Kevin who is currently managing operations at Avalon, Vic. 8,500 miles from home. 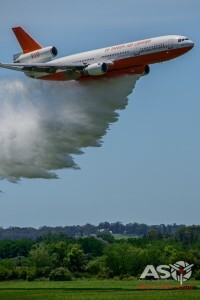 Throughout October – January, 10 Tanker ‘Southern Belle’ flew approximately 45 hours on almost a dozen fires throughout the state and further south at Lancefield and Scotsburn in Victoria with one trip to South Australia. One notable difference fighting fires here, compared to North America, is the nature of the Australian fires. “We travel all over North America, but most of our activity is usually in the western states starting in April and continuing through to November. Over there, we’re used to fighting pine and large trees that are wide at the base and narrower at the top, so the highest intensity of the fire is on the ground. Australia’s eucalyptus trees are widest at the top, but full of the trees smallest branches, which leaves a lot of fuel up high to burn,” he says. 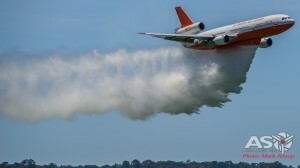 10 Tanker has flown about 40 operational hours this Australian fire season. WE THANK the Australian musician, James Morrison and his brother John for inflicting the aviation bug on ABC radio producer, Lyn Gallacher. 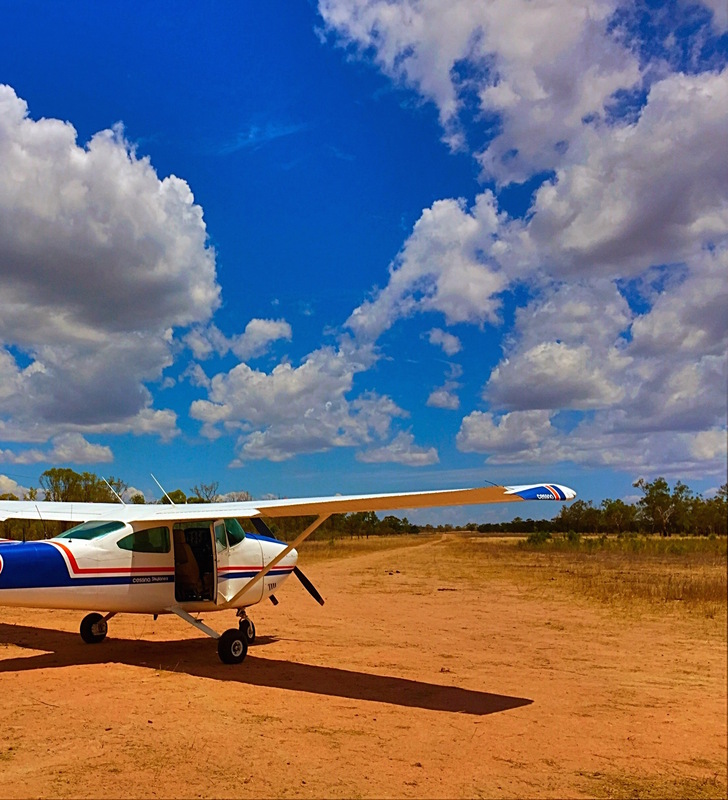 Lyn knew little about flying and even less about navigating, but a work trip to outback Australia with the Avplan EFB customers-musician-pilots at the helm, changed all that. Surprisingly (to Lyn) she loved every airborne minute and even more surprisingly (to everyone) she is now learning to fly at the small rural aerodrome at Leongatha near her Victorian home. The Music Tour That Became All About Flying: Well that’s how it turned out for me. Earlier this year I was invited by the Queensland Music Festival (QMF) to tag along with Ian Cooper and Ambre Hammond as they performed classical and gypsy music in remote corners of Far North Queensland. 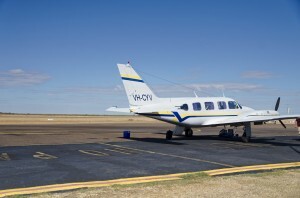 Five of us, with a whole heap of sound gear and not-too-many-spare-pairs-of-shoes, piled into a Piper Navajo with AvPlan EFB as our best friend and primary flight planning tool for this tricky landscape. We even shared our breakfast with it. This trip was the second leg of a tour that began with QMF Festival Director and sax player James Morrison at the helm. The pilot for our section was his brother John, who is also a brilliant drummer. Our leg was Burketown-Weipa-Aurukun-Hope Vale-Atherton-Innisfail. 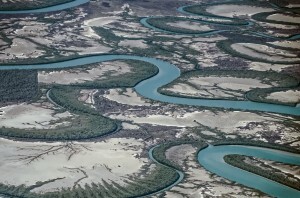 After I left, the others continued to Palm Island, Charters Towers and Gladstone. Prior to this tour I knew nothing about small planes and had even less interest in them. Now, because of this experience I am learning to fly. It changed my life. I have 9 hours in my logbook. I have an ARN. And my CASA medical is booked for next week. But, it was not meant to be this way. This was supposed to be a story about music. And that is just it. The musicians WERE wonderful. Ambre and Ian are incredible performers. Everywhere we went audiences knew they were being treated to something special. Who could imagine dropping into a world-class classical music concert in Burketown? Some of the children in Arakun and Hopevale had never seen a violin before, let alone heard Rachmaninoff. It was remarkable. Nevertheless, what made it remarkable was the aeroplane, and how it got us from place to place. As part of the radio program, I recorded much of the cockpit chatter between John and Ian. Here were two astounding musicians (Ian Cooper was our co-pilot) who were as comfortable flying as they were on stage. Listening to their banter about cloud-cover, bird strike and the dubious drunken information given to us from locals about a seldom-visited airstrip on which we were about to land was hilarious. And as I recorded the sound I found myself locking into aviation language. It was a whole other world. 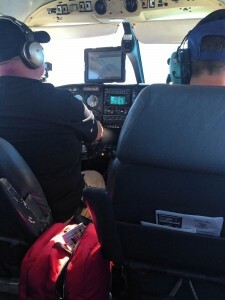 From my passenger position I could see John’s iPad displaying AvPlan EFB on the dash and I started to tie in what I could see on the screen with what was out of the window. 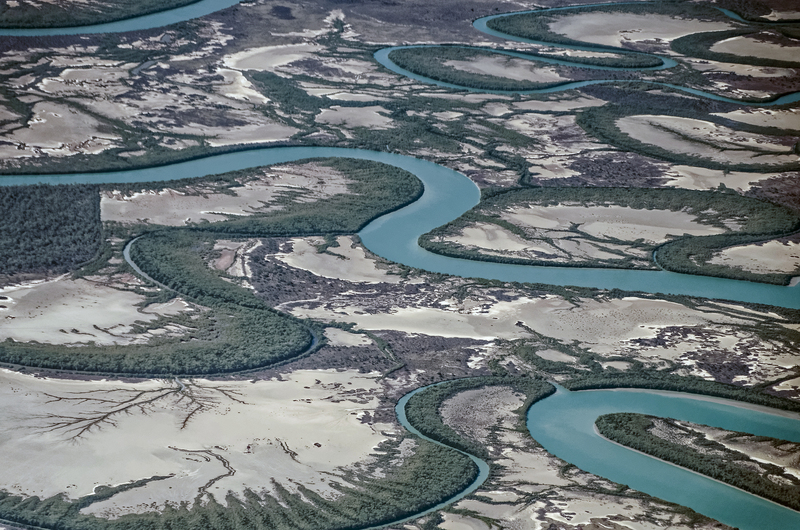 Our flight up the Gulf of Carpentaria was spectacular, but what made it even more spectacular was that this wasn’t just a scenic flight. 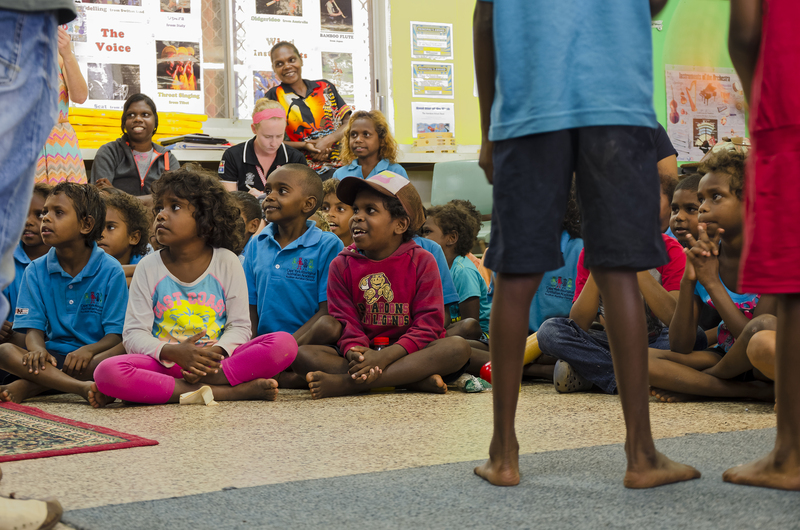 We had a mission—to bring music to remote communities—which meant performances in the evening and schools workshops during the day. It was exhausting, demanding and exhilarating work. Yet the music was, and is, what professional musicians do all the time. Flying, however, is different. We got to places that would not have been possible to access any other way and we met people who we could not have otherwise encountered. I saw an Australia I’d never imagined, and I saw how important small planes are in these locations. Just as music serves as connective tissue between odd cross-sections of humanity, so does flying. But you, as an AvPlan EFB blog reader already know this. I’m a bit slow catching on, but I’ve got it now. Lyn’s show about the trip went to air on 16 December, 2015. 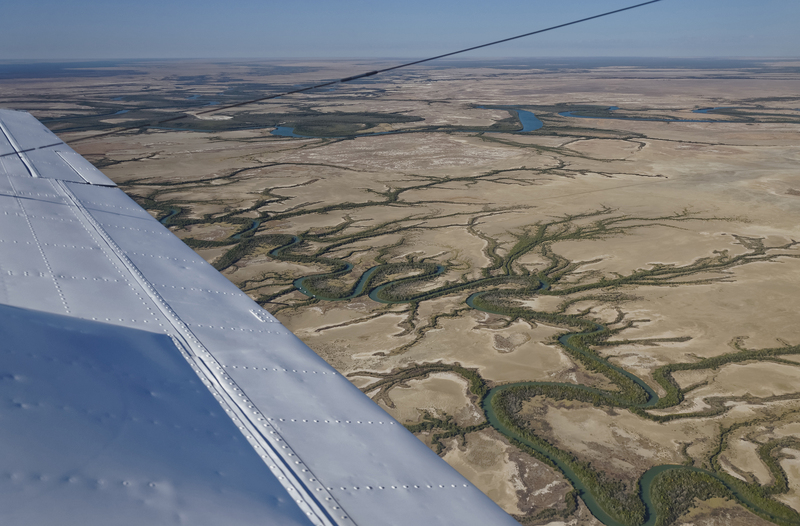 Outback pilot and Avplan EFB user Chris shares some insights into his life on a remote Australian cattle station. I’m living on a 60,000 acre (24,281 ha) cattle station approximately 40km north-west of Emerald, Queensland. 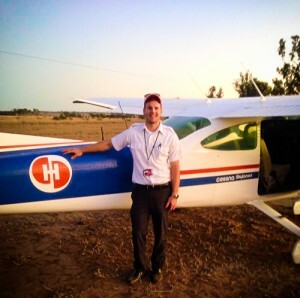 I grew up in Brisbane and moved to the outback for my first aviation job six months ago. I had about 200 hours and now have double that. – general transport of company executives. So far my job has taken me as far north as the Gulf of Carpentaria and south into New South Wales. Most of my flying is single engine day VFR. I love the diversity of my job and on my days off from flying I help around the farm. One day I’ll be flying half way across Queensland, the next I’ll be on a motorbike mustering cattle. We currently operate a Cessna 182 and I have experience on types ranging from the Recreational Aviation Jabiru to light piston twins. It’s been a childhood dream to work as a pilot. Mum says that when I was young I would run to the window every time an aeroplane went by and yell ‘plane plane’. My uncle has his private licence and took me for my first ride when I was about 9 years old. I started flight training while I was in high school, went solo in a Jabiru at 15 and gained my commercial licence and first job at 20. My first experience with Avplan EFB was in 2014 while completing training for my commercial licence. I am still quite new to the program and am finding out new features every week. It is extremely user friendly and can cater for all types of flying, whether it is for the recreational pilot or the IFR charter pilot. I particularly like the weather radar overlay, live traffic, user waypoints, distance rings and one of my favourites is the position overlay on the airservices aerodrome charts, which is extremely useful for taxiing at unfamiliar airports. Using Avplan EFB I can key in a flight plan, do the weight and balance, check the weather and be airborne promptly. 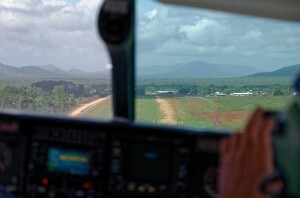 My first gig as a commercial pilot saw me flying from Brisbane to a property about 40km due west of Emerald, Qld. I was to pick up the aircraft in Brisbane and my new boss (whom I was yet to meet) provided just the coordinates of the airstrip on the property. I was also given instruction to take his parents along for the ride. Foremost in my mind was that I hadn’t even met the boss yet, I had to fly his parents to an airstrip in the middle of nowhere. Using the ‘user waypoint’ feature I was able to accurately pinpoint the airstrip. The weather radar overlay is also a great tool when flying around North Qld in the wet season. Recently I was flying the company CEO between two of our properties. It was late in the afternoon with isolated thunderstorms. Using the ‘weather radar overlay’ feature, I was able to safely divert around the storms. I think the end goal for every pilot is to, at some point in their career, end up working in the airlines. While I’m young I wish to work in as many different areas of aviation as possible – tourism, corporate, charter and aeromedical are all in mind. I love a challenging job and it would be magnificent to fly in the highlands of the Himalayas or Papua New Guinea and experience the different cultures along the way. The greatest thing is there’s always somewhere different to fly, and a bigger and better aeroplane to aim for. There are some things they can’t teach you in flight school. An hour out of Kununurra in the heat of a Northern Territory afternoon, lone pilot Lauren McLean looked over her right shoulder at the coffin she was carrying back to an aboriginal community. “Well, this is real!” she said, trying to get comfortable with her unusual cargo. 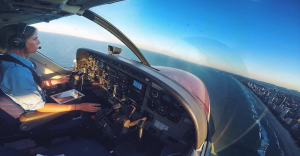 Lauren grew up within a spanners throw of Moorabbin, the main General Aviation airport in Melbourne, Victoria, and was inspired to fly after attending airshows with her parents. “I wanted to do aviation at uni, but there was no government assistance for that. I didn’t want to ask my parents for $100,000 so I did Mechanical Engineering at Swinburne. After 18 months post-grad working in the field, I returned to aviation and finished my flight training within a few months. On her first duty checked to line, Lauren saw that the white board rostered her to fly to YRSK. Bearing an iPad and paper charts, she looked up the airport, Ringer Soak, NT on Google Earth to get her head around the destination. With situational awareness so important in the Outback, Lauren admits that it’s important to have as much backup as possible. I opened the baggage compartment and waited. After about ten minutes I heard cars in the distance and could see six cars with kids running either side of them. Maybe 30 people arrived. It was a huge deal. Two kids seemed to stand out—they were barefoot and one had a plastic bag of stuff and the other had a suitcase. They were all crying: the kids, the parents, everyone. Unfortunately, Lauren’s young charges vomited all the way to Kununurra in the hot and bumpy conditions. Lauren felt as though she spent the first couple of months just trying to take it all in and her diary records a list of things that scared the living daylights out of her. 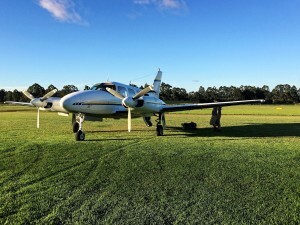 Having adopted AvPlan EFB after it was gifted to her on completion of her flight training, Lauren recalls a ferry trip from Kununurra to Coolangatta when the winds were 20 kts stronger than expected. Unable to reach her overnight stop at Mt Isa, she diverted to Tenant Creek using some fancy finger work on the iPad. Lauren is back home to complete her ATPL and instrument rating and looks forward to another season in the north. Even though she’s been quoted as saying, “I’m way too city for this…,” she readily admits she’s having the time of her life. And it shows on her face. Last Light into Coolangatta, Qld after a 15 hour ferry flight in the Cessna Caravan. 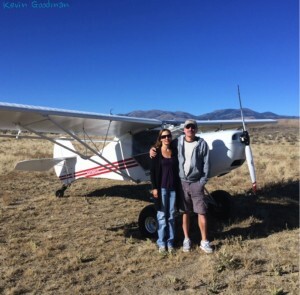 Kim from Idaho got more than she bargained for when she accepted an invitation to go on a breakfast flight with her prospective beau, Kevin in his original Avid model 4 heavy hauler. After a Friday evening familiarization, Kim’s nerves were quelled and the couple left the following morning to tour a friend’s ranch. JJ’s ranch has a 1000 foot strip at a place called Hesitation Point. Kim was wearing flip-flops on the quarter-mile walk to the house and Kevin was in shorts and tennis shoes. Ironically, Kevin had asked JJ if there were many rattle snakes around out there in the Idaho desert. Next stop was Black Rock Canyon and so after a quick pre-flight, Kevin strapped Kim in. 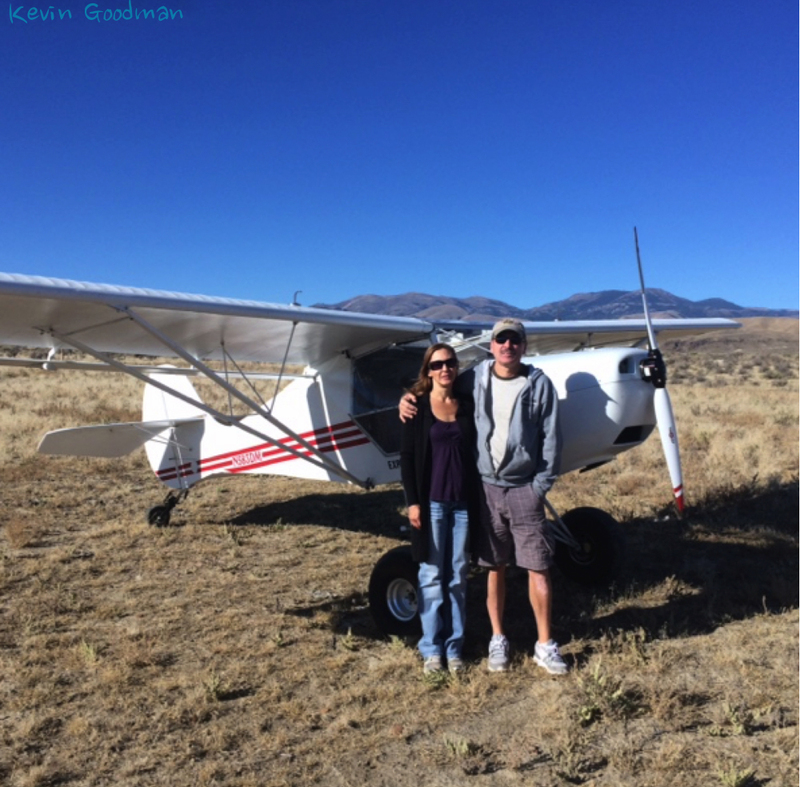 She thought the muffler heater was working a little too well and so the couple was in and out of the plane a few times, taking off a jacket and Kevin straddling the wheel leg mucking around with the heater, stepping on and off the tyre. After the dust settled from JJ’s departure, Kevin followed. “Flying is a new experience for me. I didn’t realize how much an airplane can do, like flying into places that are like taking a back road. 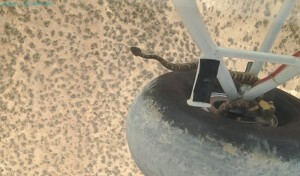 Airborne out of Hesitation Point I saw the snake on the wheel. I freaked. 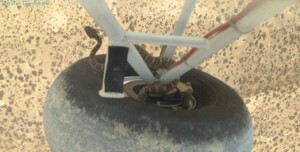 I was surprised at how the snake curled up inside the wheel and comforted that it was out there and not inside with us. Then it was quite exciting watching the snake hanging on. This experience won’t stop me from flying, but it will make me more aware and cautious in future—particularly when we’re leaving Hesitation Point,” says Kim. The snake, a three-foot rattler, was curled snug into the wheel rim and crawled out after takeoff. 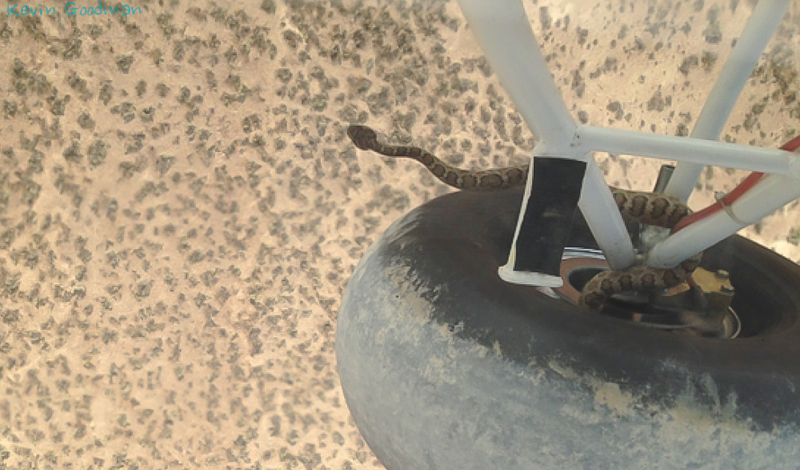 Kevin flew up the canyon and then back over the bunkhouse on JJ’s ranch where Kevin says that at 700ft the snake ‘went skydiving’ and he now teases JJ that it landed on top of his bunkhouse. The Avid was back at the Nampa airport within 35 minutes and later that week at the regular Top Fun Fliers meeting Kevin did a presentation about preflights and being careful around your wheels in the desert. He also recommended to pilots that they make a habit of keeping their doors closed because the snakes are seeking warmth and … (oooh—it doesn’t bear thinking about). “He was just hanging on the gear leg and he seemed a little irritated. The way he was coiled I thought he was going to stay there so I was relieved when he finally bailed off. I’m sure gonna check the plane a little better in future.” says Kevin. 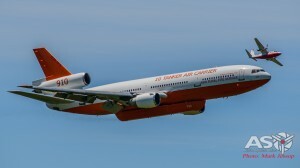 Kim wouldn’t deplane until the airplane was certain to be free of its third passenger. 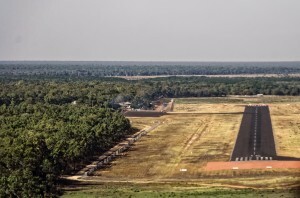 The Top Fun Fliers will soon be having a fly-in to Hesitation Point—so named because the strip is only suitable for extremely short-field operations. It has since been unofficially renamed Rattlesnake Ranch. To Kevin’s delight, Kim returned for a second date and they now regularly fly away together. AvPlan EFB users who need to find your nearest airport quickly, use the rubber band function on the map and drag it to the nearest airport and hold for a couple of seconds. The nearest airport information will be displayed. https://www.avplan-efb.com/wp/../shared/content/uploads/2016/10/newlogo2.png 0 0 Kathy https://www.avplan-efb.com/wp/../shared/content/uploads/2016/10/newlogo2.png Kathy2015-09-29 09:16:252015-09-29 09:17:29"...I got a Rattle Snake on the Airplane..."
Enter in the search term and a list of matches and their page number will be displayed. Tap the particular entry and the document will be scrolled to that page. AvPlan 1.5.1 is now available in the App Store. In this release we have added SIGMET and METAR overlays over the maps. The SIGMET overlay is still in prototype form – expect to see this being refined over the next release or so. To get the most from the SIGMET overlay, download an updated database, which includes some MET reporting points which were previously omitted.